Jim has authored numerous articles for scientific journals, trade magazines, national landmark studies, government publications and newspapers. Here are selected articles by section. For a complete list of article titles, download Jim’s resume. Saving History for the Public: Glorifying treasure hunters and denigrating archaeologists is a poor apology for the destruction of our underwater heritage. 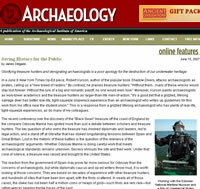 Click here to see more Archaeology Magazine articles. Excerpt: Transforming the sleepy settlement of Yerba Buena into a bustling City of San Francisco, the California gold rush brought thousands of eager gold seekers to the continent’s western shore in ships of all sizes, makes and registries. Many of the vessels were destined never to leave San Francisco, for more often than not, their captains would wake the morning after entering the harbor to find themselves in command of ships without crews. By early 1850, over seven hundred ships lay abandoned and derelict in the waters of Yerba Beuna Cove, their men lost to the lure of the gold fields. 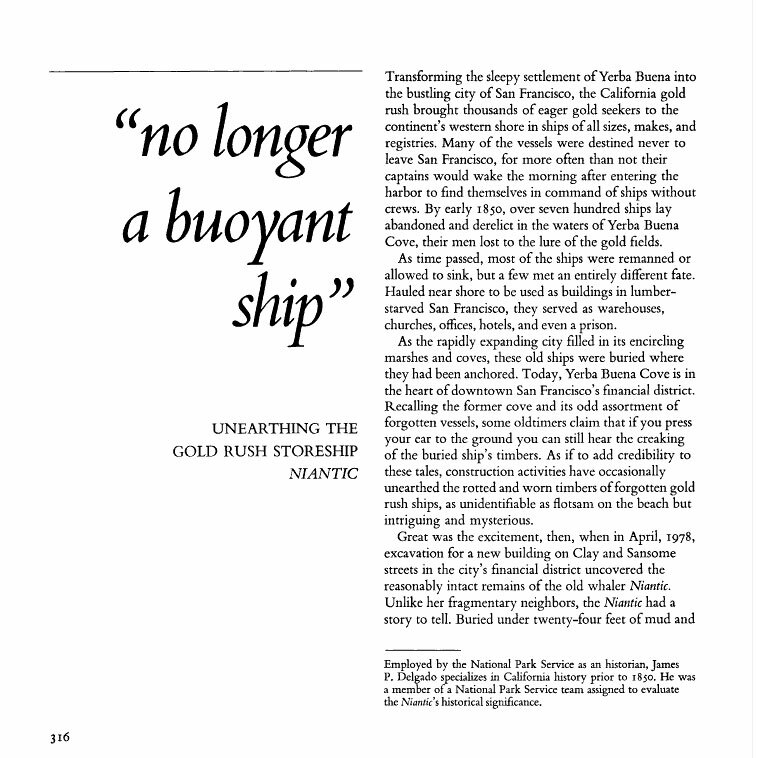 Click here to see more buried ships of San Francisco articles. 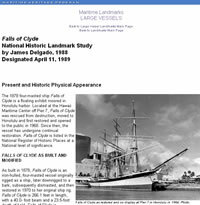 Excerpt: The 1878 ship Falls of Clyde is the world’s only surviving four-masted full-rigged ship. Built in Great Britain in the last quarter of the 19th century during a shipbuilding boom inspired in part by increased trade with the United States, Falls of Clyde made several voyages to American ports, notably San Francisco and Portland, Oregon, while under the British flag. Sold to American owners in 1898, Falls of Clyde gained American registry by a special act of Congress in 1900. Henceforth she was involved in the nationally important Hawaiian transpacific sugar trade for Capt. William Matson’s Matson Navigation Co., a shipping firm of international scope and significance that continues in business. Click here to see more NPS National Landmark Studies.